Several years ago I climbed into a rickety 1946 de Havilland Float Plane for a two-hour flight from Petersburg, Alaska for Tebenkoff Bay in the Tongass Wilderness in Southeastern Alaska. I was dropped off at an island with ten other people I’d never met. The rain was falling in sheets. We would be kayaking from island to island and camping. We chose to embrace the rain. For the next week we would kayak from island to island with rain as our constant companion. We had a great time. I was thinking of that experience yesterday as I kayaked with my wife Tricia and friends on Chebacco Lake in Massachusetts. It was October and the colors were in their New England glory if muted somewhat by a steady rain. Having been on that lake in the summer with water ski boats racing past us, this day it was just our little group. Apparently most people prefer the sun. The gift of rain brought us quiet. Slowly we paddled the circumference of that lake. Our only companions were ducks, ravens, hawks, occasionally a rising fish and of course the sound of rain. In our busy lives where our schedules guide us and our minds race, it was a healthy antidote to be on the water. Our group’s age range was mid 30’s to mid 70’s. Gliding on the water any age difference fell away and we were simply fellow paddlers embracing the rain and the sounds that come with silence. 3000 years ago a prophet named Isaiah said: “Listen and your soul will live.” All we need do is slow down and listen. 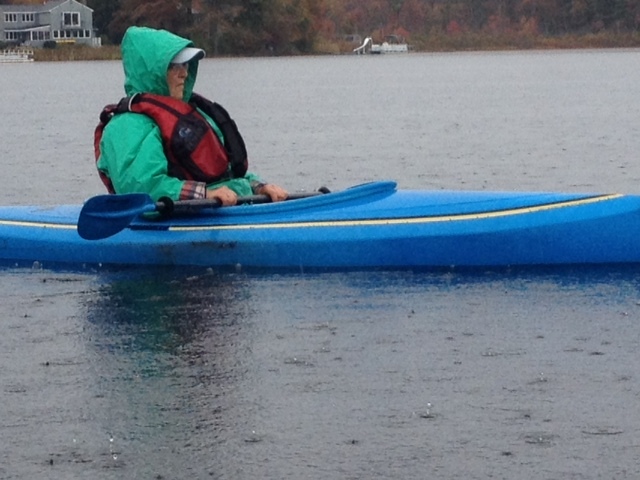 There is no better place to listen than being on the water in the rain.